Planning & organizing: who does what when? Budgeting: what does it cost? Your success depends on planning & organizing. You need to divide tasks and responsibilities for your project team. If you don’t plan and organize, you risk missing vital tasks and deadlines. Without a plan, you don’t know how your team operates. Who does what when? You should decide how activities are directed to reach your first sub goal. Are you in charge? Do it right! Is somebody else responsible? Check if there is a good plan & organization of tasks. Is the answer ‘no’? Give advice, hit the alarm or look for an exit! Your strategic communication project starts with planning. You have a picture of what you want to accomplish. You need a rough outline of the timing of the Understanding, the Designing and the Executing phase. However, you don’t know yet on which sub goal your project focuses, before analyzing and redefining the issue. You don’t know yet which role your partners will play, until you accomplished the Understanding phase. And you don’t know yet what the project’s objectives are and which means and media you will use, until you realized the Designing phase. You start with a rough outline of the Understanding, Designing, Executing and Evaluating phase. You form a project team with members of your organization, divide tasks and responsibilities and you set milestones for the main phases. Then you make a detailed organizing & planning of the Understanding phase. After the Understanding phase, you can plan & organize the Designing phase. When you know which concrete objectives and actions are needed, you can organize & plan the Executing phase. You can plan & organize the Evaluation phase at the same time and fine tune the plan after the Executing phase. When you are budgeting, you might find out that there are no resources for certain tasks. This requires a change of plan. Flexibility and creativity is key to solve these issues. You can either look for additional funds and partners – which influences your deadlines and organization. Or you downsize ambitions and identify a ‘cheaper’ sub goal. You can also adjust objectives and rearrange tasks. All these actions influence planning & organization. Conclusion: planning, organizing and budgeting are intertwined, ongoing processes. 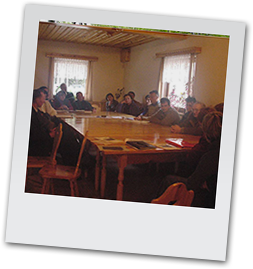 When Simona started her strategic communication project, she made a plan with IUCN CEC. They started with a rough outline of the Understanding, Designing and Executing phase. Then they made a detailed planning of the Understanding phase. Simona and her team needed two months for the informal talks in kitchens, offices and the local pub. They identified the first doable sub goal: develop new event management for the 1st May celebrations in cooperation with the stakeholders. Now Simona could plan the Designing phase. She organized round tables and meetings to develop solutions. After the solutions were selected and agreed, Simona organized & planned the Executing phase. Tasks of the Protected Area, the Municipality, the police, the hunters and mountaineering clubs were divided and timed. Finally, after the Executing phase, the Evaluation phase was planned. A series of meetings with stakeholders were organized and visitors were interviewed. Biodiversity experts often do most of the communication themselves. This way, they keep control. They make sure that information is correct. But experts are sometimes not trusted or understood by audiences. And their energy is limited. It is more effective if you manage the process and let stakeholders help you communicating. Stakeholders can send the message through their networks and media. Choose stakeholders and media which reach target audiences and have credibility. It takes a lot of pressure off your shoulders. Professionals working on sustainability change sometimes lack skills to understand target audiences and stakeholders. Understanding requires asking open questions and truly listening. Listening seems easy, but we often see people sending messages instead of listening in the Understanding phase.